Paradise! Beachfront--A Mexican-themed condo directly on the Carribean! 20 minutes south of Cancun in the lovely fishing village of Puerto Morelos. Enjoy this beautiful first-floor condo, one of only six in the building. Walk out your door onto your shaded poolside patio and the beach -- barefoot all the way! 2 bedrooms including master suite with King and ensuite bath, plus second full bath.. Totally equipped kitchen with gas stove, full-size refrigerator, dishwasher, coffee maker, toaster and blender. Fully-air conditioned plus ceiling fans. Sit out or dine on the poolside patio, sun in the private beach area, or enjoy a book or nap under the palm trees, all the while watching and listening to the beautiful Caribbean. See the waves break offshore over the second largest reef in the world. Take long walks on the beach, eithe to the north or south into the town of Puerto Morelos where wonderful restaurants await. The condos share a washer/dryer and a poolside charcoal grill.The unit has off-street parking, is gated and has an on-site caretaker. Weekly cleaning services.All towels and linens proveded. A great spot for a quiet retreat or to see everything the Mayan Riviera has to offer. Fully air conditioned; ceiling fans throughout. Full kitchen with large refrigerator, stove, and dishwasher, also microwave, toaster, blender & coffeemaker. Satellite TV including HBO; DVD player; CD player. High-speed wireless Internet. Linen, towels, beach towels, and bottled water provided. Master suite with king bed and Mexican tile bath. Weekly cleaning included for stays over a week. Twin beds in second bedroom. Parking and locked entrance gate from street. Maid service prior to arrival and upon check out. Laundry and additional maid service upon request. Caretaker lives on site. 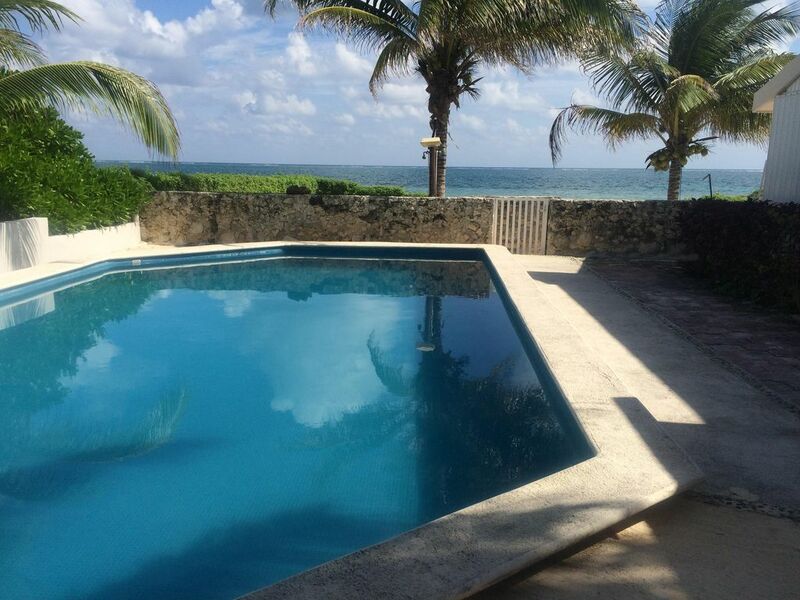 4 of us rented this 2 bedroom condo right next to the pool and only steps away from the ocean! Loved the place, plenty of room, nice furniture. Tomas the grounds keeper is a sweetie and very helpful. Would definitely go back and I highly recommend this condo. Thanks so much for the great review. We are so glad you enjoyed it! Sleepy fishing village of Puerto Morelos is 1.5 miles from condo or a 30-minute walk on the beach. Very friendly people, four-star restaurants.This is a mecca for snorkeling and diving as the second largest reef in the world is one mile off shore. Great deep sea fishing for sailfish, marlin, amber jack, mahi mahi, snapper, grouper, trigger fish, depending upon time of year. Jungle tours, Jungle Spa, Tulum (Mayan Ruins), swim with the dolphins all within 30 minute drive. Lots of nite clubs and outside cafes in Cancun and Playa Del Carmen.